A fashionable, light armor eyepatch for shady characters. It doesn\'t replace any models in the game. You can craft it at a forge or buy it at Grelka\'s shop in Riften! This mod was made before the Creation Kit came out and therefore might be incompatible with other mods or create other issues. A fashionable, light armor eyepatch for shady characters. It doesn't replace any models in the game. You can craft it at a forge or buy it at Grelka's shop in Riften! Currently works on human and kjahiit ONLY. 2) Start Skyrim. 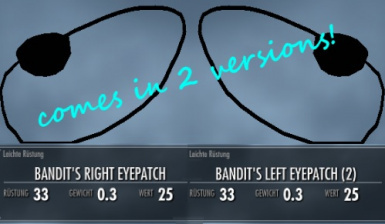 In the launcher, click on "data files" and make sure "banditseyepatch.esp" is checked. 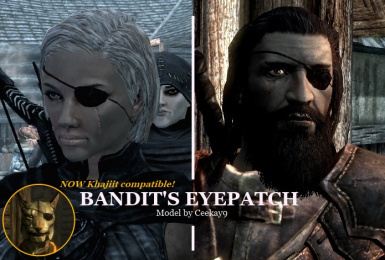 - banditseyepatch.esp and banditseyepatch.bsa from the skyrim/Data directory.